If you want to improve your experience underwater getting your own set of scuba gear is a quick and easy way to do it. When you have your own kit everything fits you better and you’ll be more comfortable diving with it. We’ve already explained how to choose scuba gear such as dive computers, dive masks or dive fins to suit your needs best. 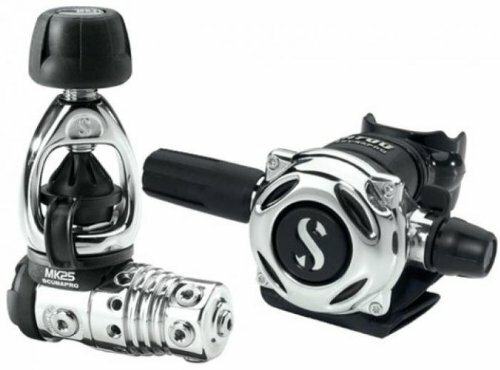 Now it’s time to talk about finding the best scuba regulator on the market. Finding a good diving regulator might be not as easy as it sounds. There are many different models and specs you can get caught up on. My recommendation is to keep it simple. Think about where and how you’re going to use it, and what features you would like to have, then check the models that fill those needs best. 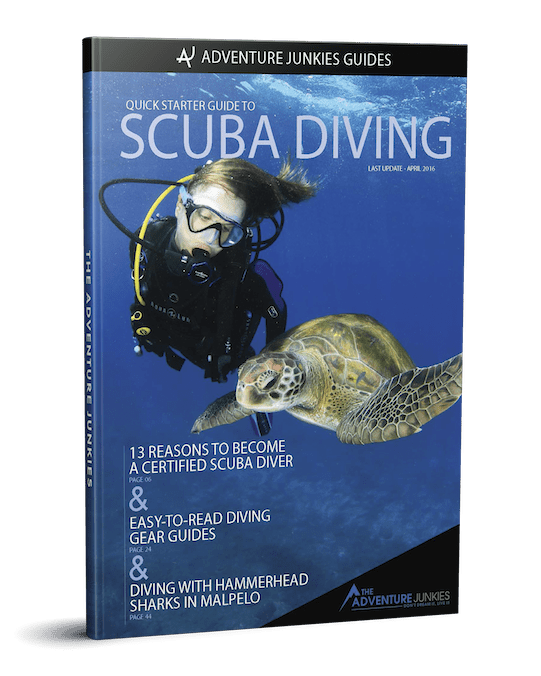 This is generally a much better approach than just buying what other divers use or the most expensive model, thinking that it will be the best choice for you. 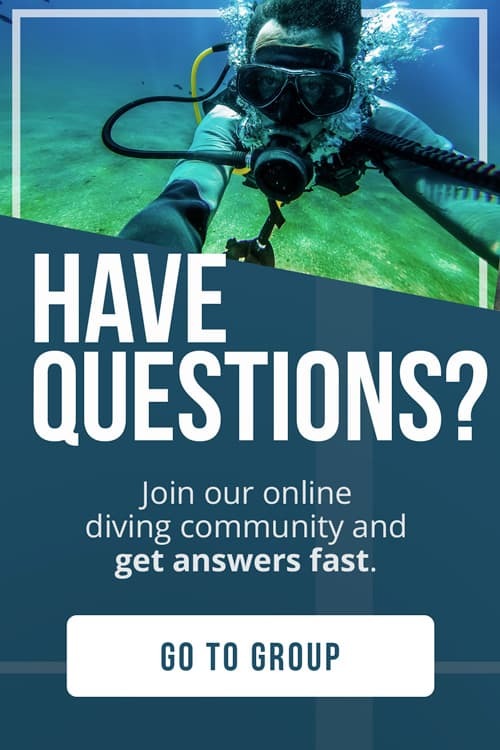 So you probably want to know what are the best dive regulators out there, right? 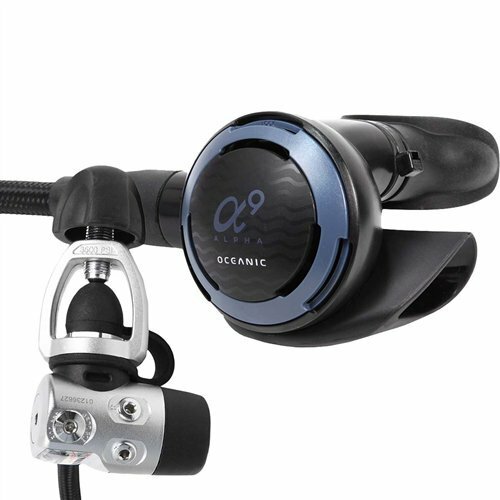 Well, that’s why we’ve put together these scuba regulator reviews to help you with the process. 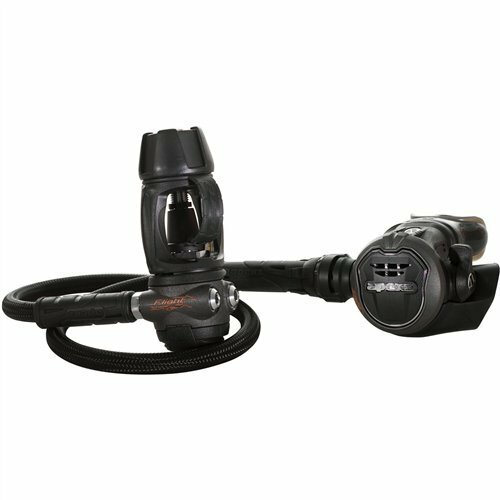 The Scubapro MK25 A700 is a top of the line regulator built by one of the most world-renowned scuba brands. The MK25/A700 is easy to breath from regardless of position. It has a swiveling first stage with five low-pressure ports and it’s rated for cold water use. A great choice if you’re looking for a high quality, reliable regulator. 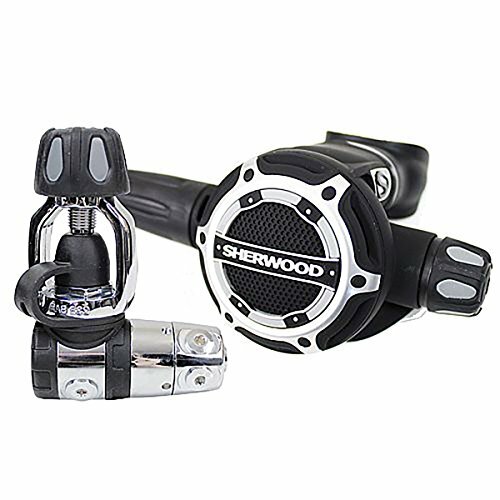 The Sherwood SR2 regulator packs advanced technology into a compact case. It’s style is contemporary and it’s made from cutting edge materials. This reg comes with 5 low-pressure and 2 high pressure ports on a swivel 360º first stage. 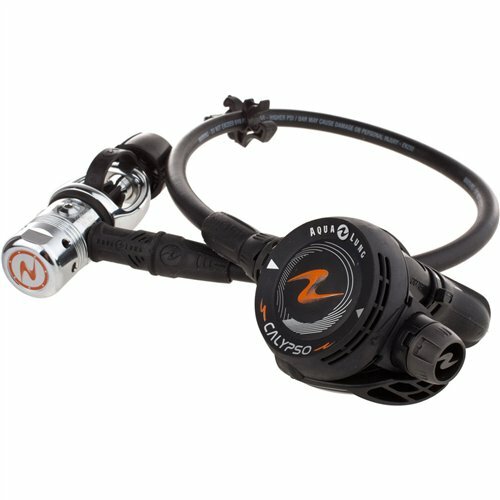 This set up is very convenient if you plan to use a dive computer with transmitter and an analog pressure gauge at the same time. 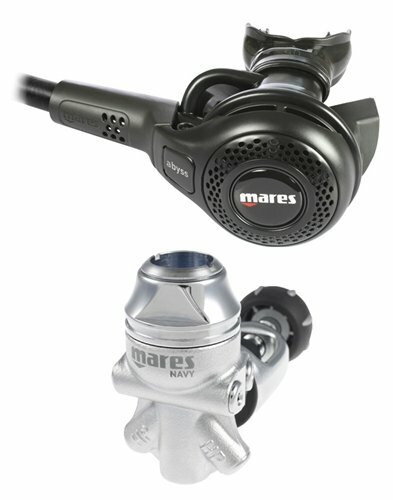 The Mares Abyss 22 Navy regulator is probably one of the best options available for cold water diving. Approved to US Navy standards, the Abyss 22 Navy uses the thermal transfer properties of an all-metal design and an oil-filled environmental seal to counteract the effects of cold water. 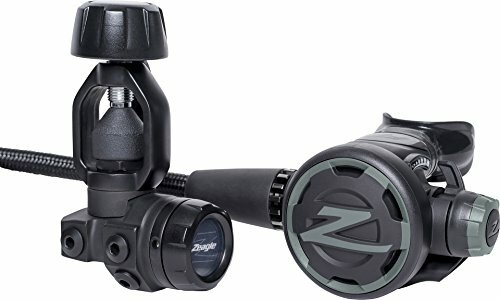 The Zeagle F8 has been rated as one of the most ergonomic and comfortable dive regulators on the market. The second stage is compact and light, the purge cover is rubbery, and the hoses come with a soft cover. Being one of the best values available, the Zeagle F8 is a great option if you want comfort without sacrificing performance. 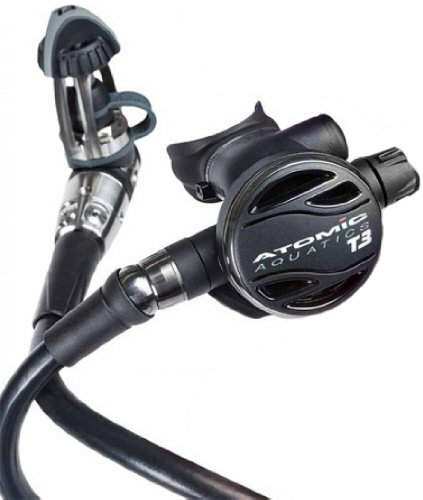 The Atomic Aquatics T3 Titanium is a premium regulator that offers a compact, lightweight and reliable package. It’s built with high-quality materials and comes with a 3-year/300 dives service interval. 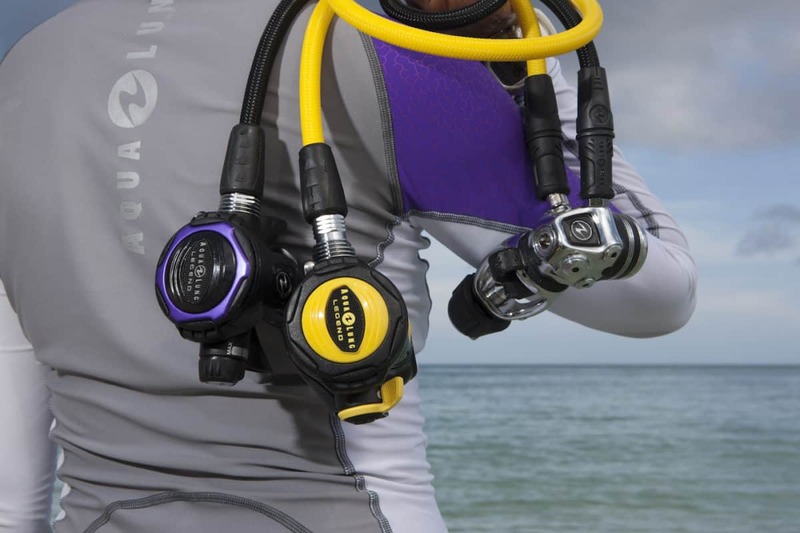 A top of the line choice for the most demanding divers at a premium price. The Apeks Flight regulator has been designed with the traveling diver in mind. It has a men’s and a women’s version, and a high-flex hose to further reduce weight. 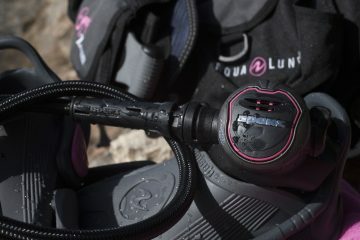 The Apeks Flight is the lightest scuba regulator on the market and the best choice for your dive travel gear set. 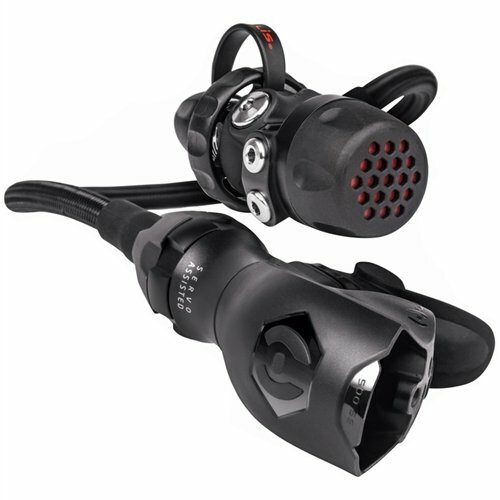 The Cressi XS2/AC2 is a long time well known regulator among the diving community. Constantly reviewed over the years, this regulator is extremely simple and strong, features that make it easy to use and result in low-cost maintenance. Its price makes it one of the most affordable models available on the market. An affordable, robust and reliable option for beginners. The Hollis DC7 500SE regulator system has been designed for both backmount and sidemount configurations. The environmentally sealed first stage protects against icing and the balanced servo-controlled valve provides precision airflow in a side-exhaust configuration. A good choice for both air and trimix tec divers. 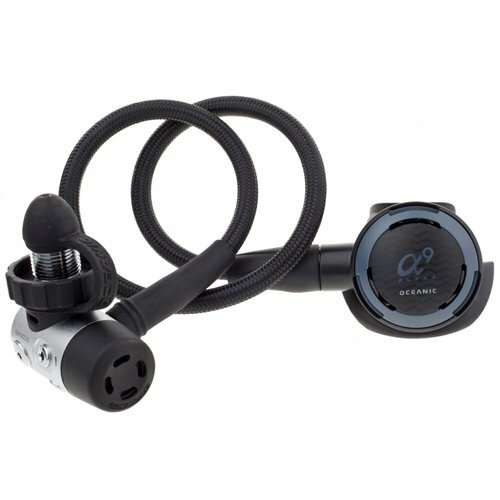 The Oceanic Alpha 9 CDX5 regulator is one of the most versatile options on the market. Ideal for both warm and cold water diving, the sealed, balanced first stage and unbalanced downstream second stage combine to give a smooth, effortless inhalation comparable with many of its high-end competitors. The Aqua Lung Calypso has a simple design and an affordable price, which makes it a popular choice for new divers looking for a good entry level regulator. The Calypso is compact, lightweight and easy-to-service. A great choice if you are just getting into the sport and don’t want to invest on a more expensive model. The first thing you need to consider when it comes to choosing a dive regulator is the water temperature where you plan to dive. This will determine if you need a sealed or unsealed regulator. For tropical destinations like the Caribbean, almost any regulator will do. An unsealed regulator means that the water can get into the first stage which is totally fine when diving in warm water. These models have the main advantage of being cheaper than the rest. But if you plan to dive in cold water, you will need a sealed regulator. The reason is because at low temperatures the water could freeze inside the first stage, blocking air flow. An environmental seal also keeps salt, sediment, and other contaminants from entering the first stage. The first stage can have a diaphragm or piston construction. 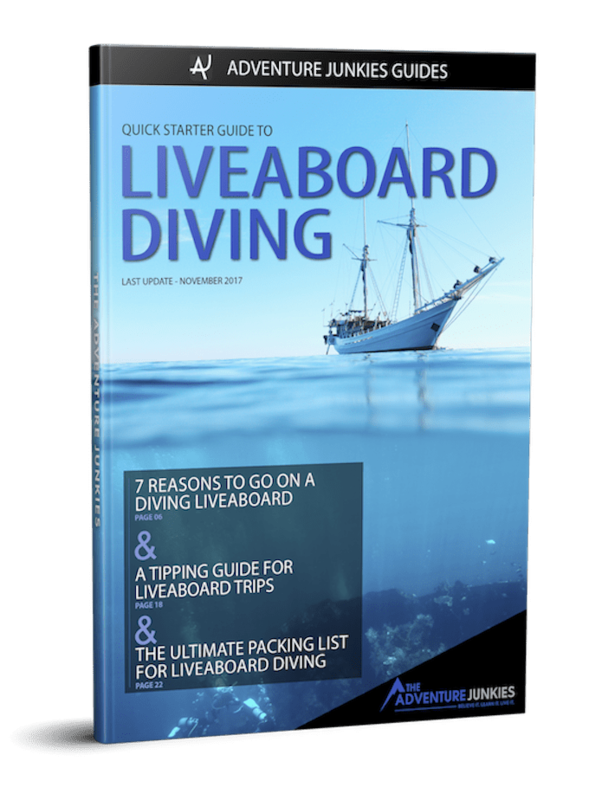 For recreational divers either one is fine, although there are some things to consider. Piston first stages are built with less moving parts and that’s what makes them more reliable. They are the preferred choice for deep divers but they tend to be more expensive than the diaphragm models. A balanced regulator has a consistent air flow no matter how much air is left in the tank or the depth you are at. An unbalanced dive regulator will become harder to breathe from the deeper you go and when there is less air left in the tank. Entry level regulators are normally unbalanced but also cheaper to service. 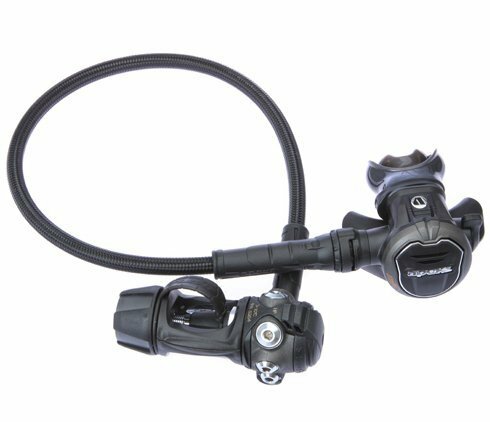 A balanced regulator is easier to breathe from which makes your dive more enjoyable. Getting a balanced regulator is something I do recommend to invest in if you have the budget for it. There are two different fittings to attach your regulator to the tank: DIN and YOKE. With the DIN system, the regulator is screwed directly into the tank. This creates a stronger seal, used a lot by cold water divers and it’s more common in Europe. With the yoke valve the regulator is screwed over the tank. It’s also called A-clamp and it’s more commonly used all over the world. It’s also much easier to screw a regulator into a tank with this type of valve. If you decide to go for a DIN system, you can get an adapter to use your DIN regulator on a Yoke valve tank. This gives you the flexibility to use it with any type of tank valve. Most of the regulators for scuba diving will come with 4 low-pressure ports and 1 (maybe 2) high pressure ports. The more ports you have, the easier it will be to set up your gear comfortably. 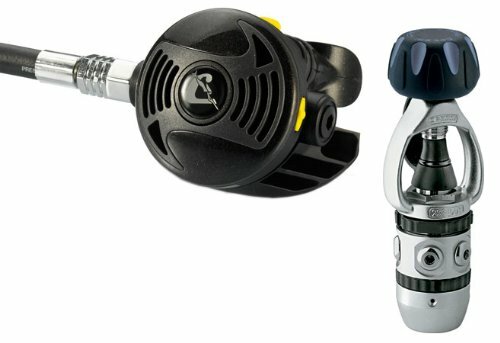 Having 2 high-pressure ports can come in handy if you have (or plan to get in the future) an air-integrated dive computer with a transmitter as you’ll need an extra port to attach it. Being comfortable while diving is the best way to enjoy your time underwater. When getting a regulator think about some aspects. How hard you need to bite to keep it in your mouth? Do the bubbles go into your face when you exhale? Is the hose too short that it pulls you back when you turn your head? These problems are normally fixed by replacing different accessories like getting a different mouthpiece or a longer hose. Just keep those in mind when looking for the best dive regulator that fits your needs. A dive regulator is a delicate piece of gear. So if you want it to last, you’ll need to take care of it. After every use, dry the dust cap before putting it back. You can use your tank or by simply blowing into it. Once it’s dry and in place, you should always rinse your regulator with fresh water (warm water if possible). It’s recommended not to dump the first stage in the water. Just give it a splash. Once washed, allow enough time for it to completely dry before putting away. Remember to store your regulator in a dry location and out of direct sun light. Want to learn more about caring for your scuba gear? 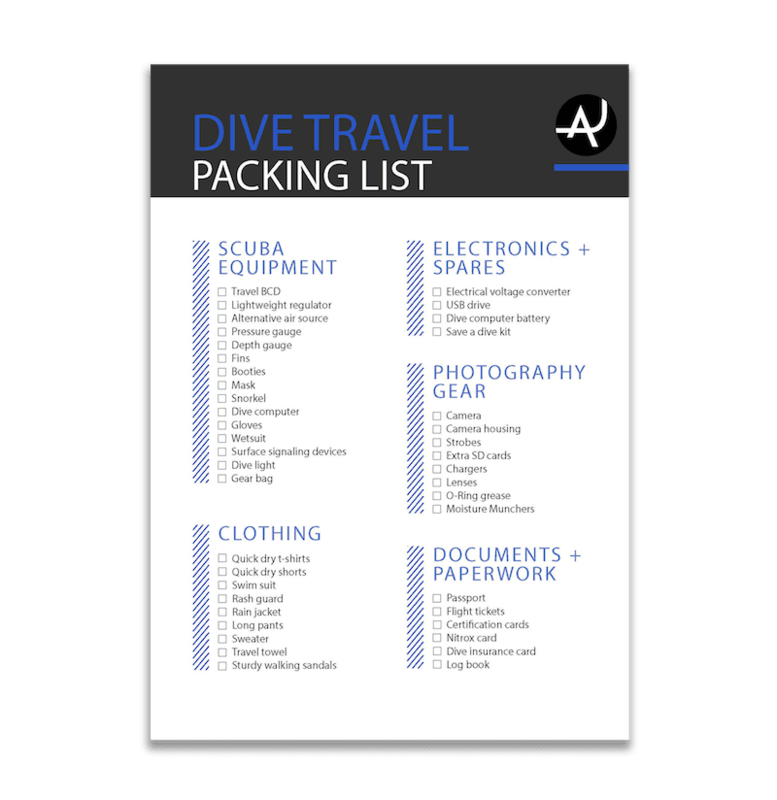 Check out our guide on how to maintain and store your scuba equipment.